This is a quick post to share with you my small weekend surprise. 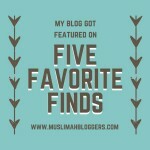 Last month I sent an email to Muslimah Bloggers to be associated with them . I got their reply that I can do it online via their link, I did it but then there was no mail or notification , If I am added or not ,neither could I find my blog on their list .